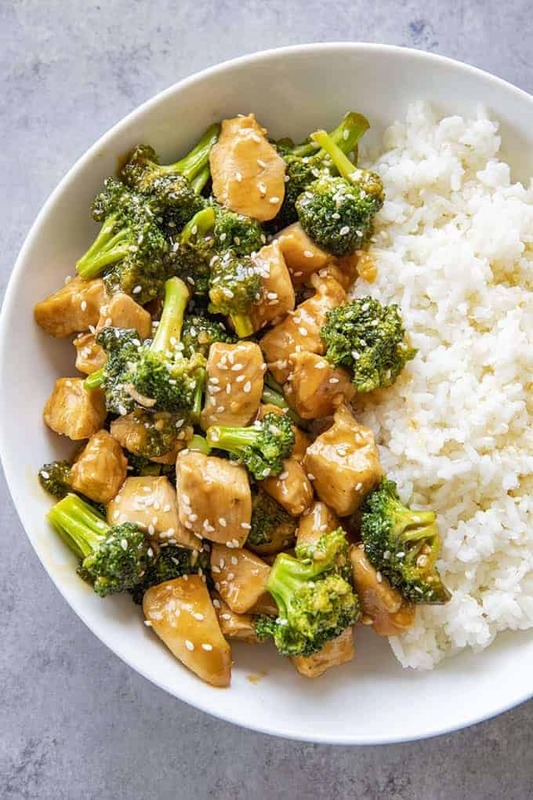 Honey Sesame Chicken and Broccoli is made in one pan and ready to eat in 20 minutes! You will love the mouthwatering sauce full of sesame, garlic, and honey! This Chinese style chicken with broccoli has become a new lunch and dinner obsession at my house! I always have the ingredients to make the sauce on hand, and of course, we’re always looking for fun new ways to use up chicken. This is great for a quick weeknight one-pan dinner, or it can be made ahead for meal prep for the week. It is great by itself with white, brown, or even cauliflower rice! To start, you will need 1.5 pounds of chicken breasts, then you will cut them up into half inch cubes. Take a couple heads of broccoli and chop into florets, discarding any big stems. You will need 2 cups of broccoli in total. You will heat some sesame oil along with olive oil in a large skillet over medium-high heat and sear the chicken for about 5 minutes. Then, add the broccoli and cook for about 3 more minutes until the broccoli is bright green and crisp-tender. 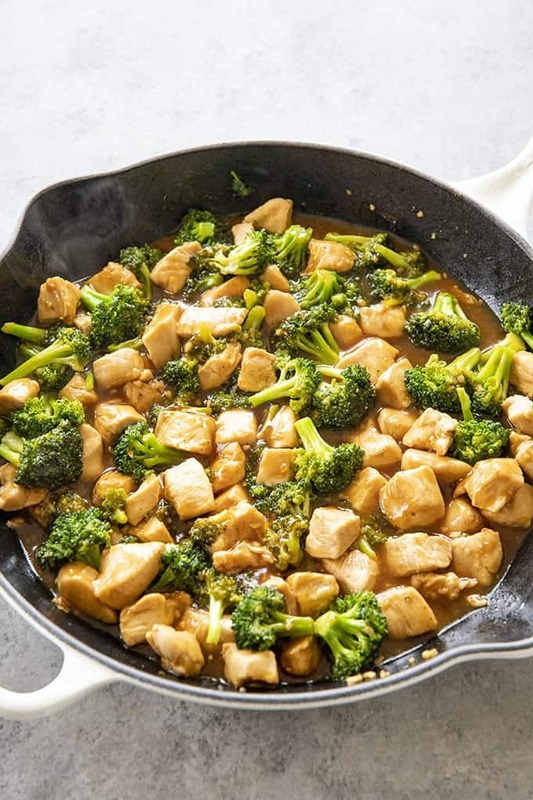 While your chicken and broccoli are cooking, you will whisk together all of your sauce ingredients in a small bowl. Pour the sauce over the chicken mixture and simmer over low heat for just about 3 minutes until the sauce has thickened. Is Chinese Chicken and Broccoli Healthy? While I am not a nutritionist, this dish is considered healthy to my family and I. It is full of lean chicken, and vibrant healthy broccoli. The sauce contains honey, however, it isn’t much per serving. This dish is a great low-calorie option in general. Heat a large skillet over medium-high heat with the olive oil and HALF of the sesame oil. Add the chicken cubes and salt and pepper to taste. Sear the chicken, stirring and moving around for 5 minutes until chicken is light golden in color. Add the broccoli to the skillet and cook, stirring occasionally for about 3 minutes until the broccoli is bright green. 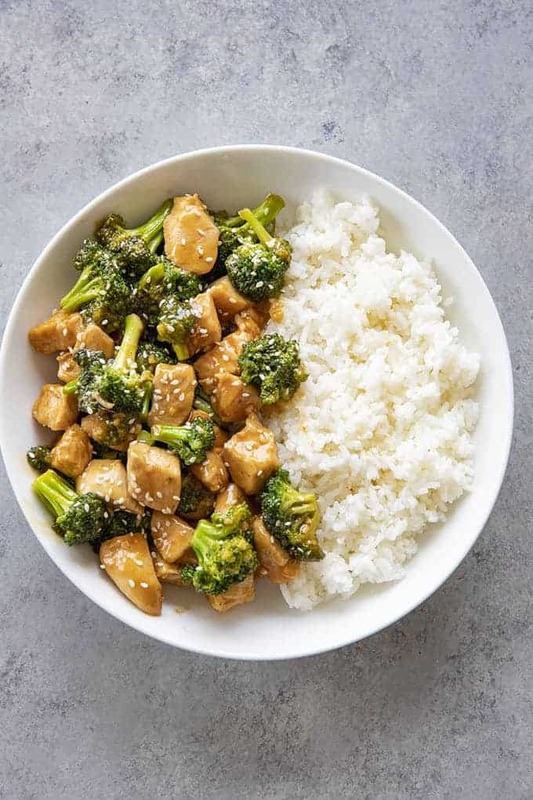 While the broccoli is cooking, whisk together the remaining sesame oil, soy sauce, honey, sriracha, water, and corn starch in a small bowl. Reduce the stove heat to medium-low and pour the sauce over the chicken and broccoli. Simmer for 3 minutes, until sauce has thickened. Serve immediately with rice, or cauliflower rice. NOTE: The sriracha for this recipe is optional, but, it adds great flavor and does not make the chicken too hot. If you do not have sriracha, you can add hot sauce or red pepper flakes to taste. NOTE: This recipe can be prepped ahead and stored in airtight containers in the refrigerator for up to 5 days. Yum, this is delicious. We love making homemade Chinese food. This looks delicious and also straight forward to make! Only using one pan in also a definite plus for me as I hate having to wash every pan in the house after making dinner! 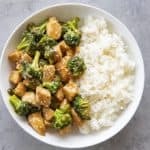 I’m a big fan of broccoli and I make this dish with tofu and with root vegetables. It’s a quick and easy tasty dish and kids love it too. I love anything with broccoli! This looks like a perfect family meal. This looks like a great thing to make for a lunch for work! I will have to try it for my husband! This looks really good. My favorite combination- rice and broccoli. Also easy to follow the steps! So easy and looks delicious! Chicken and broccoli are two of the few things that my entire family agrees on. We make someting similar but I want to make ours more honey! This sounds delish!